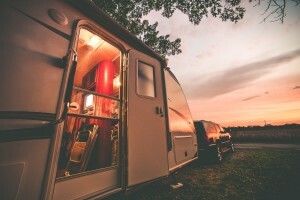 Having the comforts of home around you when you travel is one of the perks of RVing. And the more you travel, the more you realize you really do need some nifty must-have gadgets for RVs. Take a look below and let us know what else you’d add to the list! No need to go home with dirty clothes, scrounge for quarters or over pack because you don’t want to use the RV parks questionable Laundromat. There are a number of portable washers on the market—you’ll find electrical and solar—but believe it or not, there’s a washer that requires neither! The Drumi can handle 5 pounds of laundry at a time (say, one pair of jeans or 6 t-shirts) and is powered by a foot pedal. Sure, it’s not your front-loader at home, but how much do you really need to do on the road? WiFi at parks isn’t always the best—not to mention half the time you can’t pick it up INSIDE your rig—so if you want to stay connected while you’re parked, you might want to invest in a WiFi extender. A high gain antenna outside your RV will help get the signal past the aluminum skin or bracing of your rig that might be interfering (even if yours is fiberglass, your neighbor’s might not be doing the blocking). Two-way radios, also known as “walkie-talkies,” are really cool gadgets for RVs and can come in handy when you’re parking a big rig, when you’re at an event or even at an amusement park—not to mention you very well may be in places where there’s no cell phone reception. If you have two vehicles you’ll want to keep in touch while you’re driving, plus, it’s fun to say “over” after every communication! Make sure yours are long-range, like these. RVs are notorious for having a minimum of storage space, especially in the kitchen. Collapsible prep bows, mixing cups, salad spinners and the like are just what the chef ordered. Use the back of your cabinet doors for things like wastebaskets, use suction cups to hang small items, get an over the sink dish rack or get something as simple as a peg board set up to hang your pots, pans and cooking utensils. Sounds simple enough, but sometimes it’s the simplest of things that are the handiest gadgets for RVs! Whether you’re washing your rig, stowing (or getting) stuff from high cabinets, fixing your awning or much more, you’ll be happy you invested in a folding step stool every time! A high-power, high-quality flashlight is a given in most rigs, but you really want to have more than one. Kids enjoy them and they’re great for walking to the front office, walking the dog or a nighttime walk though the woods. We also recommend having at least one headlamp—there’s nothing like hands-free light when you’re fixing something important or searching through your storage bay outside at night. Do you have any faves?